As is often the way in horse racing, jockeys are associated with the animal they achieved headlines. jockey who occupied the saddle for most of those starts. Parkwood Stable’s Kingarvie was the overwhelming favourite for the 1946 King’s Plate and he won it in a gallop with Dewhurst up. They also won the Plate Trial and a year earlier won the three major races for juveniles – the Coronation Futurity, Cup and Saucer and the Clarendon Stakes. Dewhurst and Kingarvie would also pair up to win the Canadian (International) Championship at Long Branch in 1946. At age 18 Dewhurst rode his first winner, June 26, 1941, at Hamilton, Ont., breaking his maiden on Rye Grass, a 28-to-1 long shot. 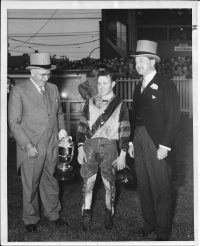 Throughout the 1940s Dewhurst was often among the leading jockeys in the province. He was the leading money-winning rider in Canada in 1946. As well as Kingarvie, Dewhurst guided numerous outstanding horses into the winner’s circle during his 15-year career. 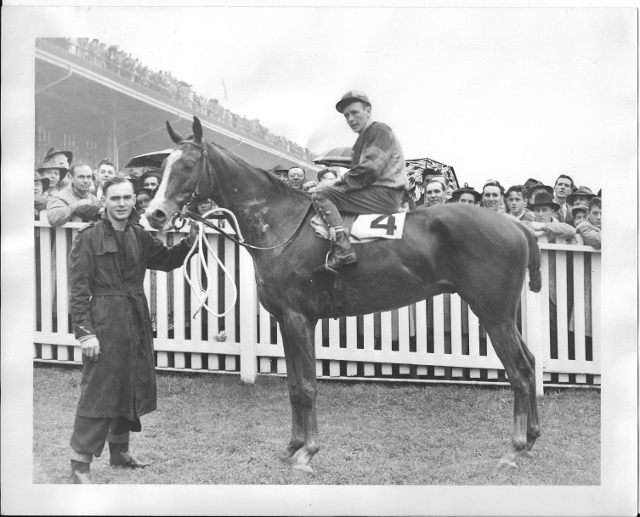 Probably the best was George McCullagh’s Speedy Irish, his mount in the 1949 King’s Plate. The colt was a slight favourite but finished second to E.P. Taylor’s first Plate winner, Epic and Chris Rogers. Dewhurst and Speedy Irish had dominated the racing scene in 1948, winning the Cup and Saucer, Coronation Futurity and Clarendon Stakes and prepping for the Plate with a win in the Plate Trial. He performed for stables owned by J.E.Frowde Seagram, Col. John E. Smallman, Globe and Mail publisher C. George McCullagh, Harry C. Hatch and his main outfit, McLaughlin’s Parkwood Stable. Two broken ankles forced his retirement following the 1955 season. It is estimated he won close to 500 races. Dewhurst died in 1972 at age 49.